←Are You Blurring the Line between Work and Play? Photo courtesy of Hey Paul Studios. Every multipotentialite knows how it feels to share a new interest or endeavor with someone and receive a blank stare or a look of disapproval. You’re in an art program. Why would you want to take a math class? When are you going to stop messing around with all of these different things and commit to something? The negative responses we receive range from genuinely confused but well-meaning, to outright nasty and critical. Here are a few strategies to help you deal with people who don’t understand (or even disapprove of) your multipotentiality. Who is this person? How much does your relationship with them matter? Are they a good fit for you? If the disapproving party is a parent or close friend, it’s worth trying to reach an understanding. If they are a passing acquaintance or someone you don’t care much for anyway, it might be easier to NOT explain or seek their approval. It might not be worth your time to open up a discussion with a person you don’t want in your life. Try these tips if you’re dealing with a casual acquaintance. It’s difficult not to feel defensive when someone makes you feel as though you have to justify your life choices. If you feel up to it, explain what it means to be a multipotentialite. If not, passing along resources might be your best option. 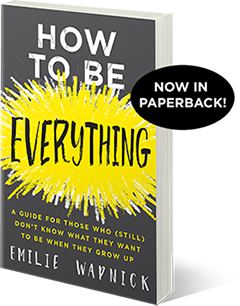 Send them to the terminology page, give them a copy of Refuse to Choose, The Renaissance Soul, or my new book, Multipotentialite (once it’s out). Share examples of famous multipotentialites like Steve Jobs, Richard Branson, Oprah Winfrey, Maya Angelou or James Franco. If you know anyone in your family or local community who has many careers or projects, use those examples as well. Know that the people who love you only want the best for you. Most parents who question their children’s choices are simply worried. They want to ensure that their child grows up to be self-sufficient and financially stable. Explain that in the 21st century, and with the current unpredictable nature of the economy, it is more important than ever to be adaptable and to be able to switch gears and learn new things quickly. You can point them to the Generation Flux article over at Fast Company or give them a copy of A Whole New Mind by Daniel Pink. Pamela Slim’s new book, Body of Work, contains a section where she talks specifically about multipotentialites. If you don’t want to bombard them with too many resources all at once, Refuse to Choose is a good starting point. Family and friends will often back off eventually, if they see that you are happy and making a decent living. When I was interviewing people for my book, I heard this story again and again. Sadly not everyone eventually comes around. There are still parents (it’s usually parents) who, perhaps due to cultural issues, are unwilling to see an unconventional career path as anything but bad. These situations are always painful. The best thing you can do is to create your own “family,” as it were, to seek out supportive friends and community who understand and accept your multipotentiality. It is said that an individual is the product of her five closest friends. Who we choose to surround ourselves with profoundly impacts our motivation, our goals and what we believe is possible. Consciously select the people around you. 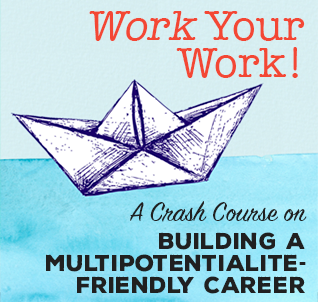 Look for multipotentialites in your life that you could deepen your relationship with. Head over to meetup.com and seek out groups of artists, entrepreneurs, or other people who are doing their own thing. 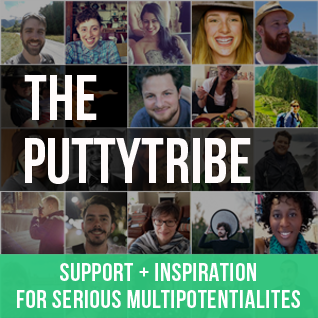 Another option is to join the Puttytribe, where you will meet a self-selected group of multipotentialites who want to connect with other multipods. You can also reach out to people you see commenting here on Puttylike or on other blogs you enjoy. You can, and should, try to explain your multipotentiality to the important people in your life. They might get it after a little bit of explaining and some resources, or they might need more time to come around. But whether or not your family and friends approve, you need to live your life and do your thing. Get out there, start pursuing the things that fascinate you, and find your people. How do you deal with people who don’t understand, or even disapprove of your multipotentiality? 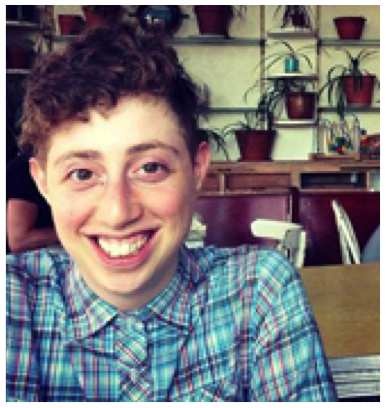 Emilie Wapnick is the Founder and Creative Director at Puttylike, where she helps multipotentialites integrate ALL of their interests into their lives. Unable to settle on one path herself, Emilie studied music, art, film production and law, graduating from the Law Faculty at McGill University. She is an occasional rock star, a paleo-friendly eater and a wannabe scientist. Learn more about Emilie here. I get this a lot from my family – “When will you finally stop messing around the world and come home at last?” I’ve never been able to pick a career or a path, I’d try every possible riddiculous job that I had a bit of talent for or that seemed interesting enough but most of it was crap and I left it after a year or something. And they were all sorts, didn’t really have much in common. My parents, I guess, still expect me to find that one that will do, one that I could stick with for at least next five years, that would give me some career experience and option to go higher, probably in the same field. They want me to settle but I can’t change who I am. They’re like “you had your fun in England, haha, but when are you coming back?”. They can’t or don’t want to understand that I might not at all. But I believe this is mostly because they are afraid. They were used to having me around, even though we could eat each other’s faces, it is handy to always have your kid under your roof so that she can help with whatever needs to be done. First few years I was very defensive, mostly because I myself didn’t know what multipod is and I didn’t know that I am actually very ok. I believed they were right and that there was something wrong with me and it was driving me nuts, all those years not seeing any way out. How am I going to fit in this world?? But I tried to avoid the confrontation and the hard answers like “yeah, that’s nice for now but what’s your long-term vision?” I never had one and I still don’t, pretty much. But I don’t mind anymore :) I went away, so that I don’t have to deal with those questions and also to explore the world and find out all other options. Now that I know I’m not alone, I find such question quite mindblowing because it always shocks me a little that there are people who still think picking a career is the only choice. It also became much easier to let go of nonsupportive people. When there is so many that understand, why waste time explaining yourself and feeling bad about not fitting in? There is a whole another world where you do fit perfectly, no matter what you do and what will you do next. Who needs a long term picture? Just do whatever interests you and keep yourself motivated and having fun. As long as you’re able to make money and make a good living, who needs a boring 9-5 job? They’re generally really supportive though. But sometimes comments like this will slip out, and usually I try to take it as revealing my parents own ideas about what it means to be happy. As always, a fantastic article:)! Unfortunately for me, the ones who don’t understand are my parents and my best friend – all of them having a normal, 9-5 job. Not exactly the best situation to thriveXD! Up until now, I’ve found that having an alternative community supporting you is the best strategy to deal with dear ones uncapable to understand, less alone appreciate, your multipotentiality. I remember one research saying that it takes five positive things to balance a negative one, so as soon as my best friend tells me to “settle down and grow up,” I run to the forum and join a huddle, or spend a humongous amount of time on one of my creative projects or on reading articles like the one on the Generation Flux. Knowing that outside your everyday circle there is a *world* of people agreeing with you is a good cure against negative words. That said, if someone close to you is anxious about your lifestyle, it often makes you more anxious in return, and it doesn’t help you live your multipotentiality serenely. When it comes to your emotional well-being, I believe that the best solution is to just get out of that environment as soon as possible. Ditching “friends” feels awful, but we should put our emotional healt at the top of our priorities’ list. I was wondering if someone ever resorted to something drastic to stop naysayers from hurting you? I used to find it really hard to explain my fleeting interests until I found Puttylike last year, mainly because I wondered myself why I couldn’t just stick to one thing (because that’s what society teaches us). Now I just beam a big smile and say “because I feel like it” or “because I like to learn new things”, or simply “why not?”. Such a great point! I’ve found that, too. The more confident you are with what you’re up to, the better other people will react. Great post Emilie! The idea that resonated with me a lot is the one from Chris Guillebeau’s book. When we were kids parents and other important people have always asked as: “If everyone jumped of the bridge, would you jump as well?” Nowadays, it seems as if they are telling us :”Hey, everybody is jumping of the bridge, what are you waiting for?” That “jumping of the bridge” is the metaphor for conventional life, doing what is expected of us,settling for mediocre life. I think it also relates to the multipod problems of not being understood. Becoming boring, conventional, just as everyone else, settling for one single interest, thinking linear approach,these all are certain ways to stay stuck, average or to jump of the bridge. If your life eventually looks like that, it doesn’t matter who approves of you, right? Absolutely. I’ve always loved that metaphor, and it definitely applies here. Yeah, artists in particular can be very touchy about their choices. My guess is that their trying to impose a specialist lifestyle on you has more to do with their own denial of their plurality and choice to work in one particular medium. And the feeling that that was and is the only way. Keep experimenting. It sounds like you’re doing everything right. Thanks for the tip– giving loved ones examples of successful multis. I know that this is an old post, but I just wanted to add that a perfect example of a multipotentialite is in the movie Elevator Girl starring Lacey Chabert on Hallmark Channel. She had 3 different jobs, did not complete her massage therapy licensing and was going to culinary school. She ended up dating a conservative lawyer who had only one thing going in his life: being a lawyer, or better yet, a new partner at his firm. He enjoyed his time with her and often lost track of time and the world whenever they were together. However, he ended up exploding at her for not being able to settle down and do just ONE thing. As I watched that scene, I started to cry. I thought it was hormones or that “time of the month”. But then I realized that it was because I felt like her boyfriend was yelling at me. His words resonated with those of my loved ones who have said, “When are you going to settle down?” or “You have to choose just one” or worse yet, “You have to finish what you start”. For years, I thought I was just a flake. Until now. I’d like to thank you, Emilie, for this article and especially this website. Now, I kind of just ignore the comments and questions. I know that my loved ones mean well, but I am who I am. And I can finally give them a valid explanation for being the way that I am. Ellen, I want to watch that movie, “The Elevator Girl” and can’t find it anywhere! not for sale or for rent, in stores or online. I’d love to see it! How did you? Late to find this article but so helpful. I’ve been studying again for a few years now and finally made the leap this year after a transition year. It took a long time to figure it out and I know that while there may be one or two main elements to my work, one of my vision elements was to always keep learning, as I get bored with routine, so I know I will have a few things on the go. Late finding the article (and this most amazing website) as well. I remember those exact words from my friends and family. “Why can’t you just pick something.” It was like someone speaking gibberish to me. How could I just pick one thing, one activity for the rest of my life? You tell me people do this? This sounds absolutely boring! And I fought their comments and continue to fight it. The world is too amazing to just get into one thing. But as you have mentioned, I have learned to curve my responses. When ask “what i do for a living, I focus on my job. Or i respond with “oh, this and that.” Usually a family, especially parents, just want to know your safe and secure. IT’s just gradually walking them through the idea that you can still be safe and secure in a multipotentialite world. Firstly I just wanted to say I am relieved to find this community! I’m 32 years old, I have two children and I finally feel like I have an explanation for why I find it hard to commit to one role. I studied Business at university. Over the years, one of the mantras I kept hearing from business people was “diversify your product line” and in investing, “it’s always better to have multiple income streams” – and yet there is no mainstream career guidance which shows young people that this is in actual fact a pretty intelligent way to conduct our careers, too. I’d argue that in this economic climate, we multipods are far better positioned to weather financial hardship than anyone who is solely staying put in one place for 10+ years. Looking forward to meeting more wonderful multipods like myself, and thank you Emilie for creating this centre of resources! What a pity that I’ve discovered this community at such a late stage – a retired person. I guess it started with my father telling me that I was a “Jack of all trades and master of none” If I began something I was expected to go on until I was the best at it, whether it was ice skating, playing an instrument or academic. I just wanted to try everything to see what it was like. Later I spent 5 years training as a medical scientist, and then 3 years bored out of my mind with it. At 21 I decided to play the clarinet (because I hadn’t been allowed to learn the piano earlier – the time needed to be committed to my schoolwork), and got to Grade 8 standard when, you guessed it, I tired of it. Since then I have been a wife and mother, worked on a library information desk, gained two degrees (as an adult) and part of another, and latterly coached mathematics to 13-17 year olds. Now, retired, I’m still moving from one interest to another. It may be Geology or History or something else I never had time for before. Finally I am not required to justify what I do or pursue it past the time when it interests me. It is very liberating, and now, having heard Emilie, I no longer have to worry that I never achieved my full potential in any one area. I’m about to launch my firsts blog. Three topics rolled into one [naturally] under the guise of a lifestyle blog. Which none of my family are excited about. But they were not excited about the book I wrote in 3 months and listed on Amazon. Come to think of it, they have not been excited by any of the projects I’ve got on the go. I guess that wore out a long time ago. Good news is I sent the link to your TT to my daughter who is a fashion buyer in Berlin. She told me when she comes home she is opening a Yoga Studio. I guess it in the genes! Ps Looking forward to you talk – you will love Australians – were a bit weird – mostly. They will adore you. Have fun. Your talk really helps me handle challenges. It all started when I was in fifth grade, answering the teacher’s question on what I wanted to be. Oh no, I wanted to be just one thing, that wasn’t the problem. But while the boys wanted to be a police officer and the girls a teacher or nurse, I wanted to be a paleonthologist (without watching Jurrasic Park). Then, several years later, I decided I wanted to become a veterinarian. A couple of years passed and I decided I had it all figured out: I would study Psychology. Which turned into Social Work. To which I added Cultural Anthropology to add some challenge. Dropping Social Work several months later because I became bored. Adding Information Science (I was more interested in Marketing, but the university programme seemed rather boring), eventually majoring in both. Then, of course there were other interests. At 11 I became obsessed with chess, an obsession that lasted for almost six years, weakening over the years. Once I quit chess, I took up photography. I thought that would be it, the next big thing for me. Obsessed over it for several years, until it toned down into a hobby I practice now and then. Then I turned to cooking and baking. Then to pole dancing. That’s not mentioning the things I do in between. My problems are two. One is multipotentialite-wide: I don’t focus. I work in consultancy and everyone keeps telling me I have to focus. But damn it, I don’t want to focus. I want to do it all (especially since there’s tons of overlap). Okay, I’m working around that (I’m still doing lots of things, calling it a nice specialization, quite like you suggest). The other problem is bigger and I feel like I’m the only multipotentialite having it (okay, rationally I’m probably not, but I haven’t found anything on your blog about it yet): I’m good at photography, but I’m not brilliant like a specialist would be. I can cook a fine dinner, but in no way like one of those people who really make it their life. I never make it past subtop and I feel – quite continuously – like I’m not good enough for it. I feel like I’m a multipotentialite in the full meaning of the word: I CAN do lots of things, but I’m not the best at anything (nor second best either, just pretty good at best). Just yesterday at work I had an appraisal about a project I was doing part time, and I got an “as expected”, which roughly means: “you did fine”. And my manager compared me with a guy of my level who did a similar project full time (while I had a large other project). And I was like: how the hell am I supposed to compete under these terms? So I guess that’s my question: how do we compete with specialists? I’m really getting fed up with not only never feeling good enough but not even being able to talk about it because everyone around me thinks I can do anything I put my mind to. 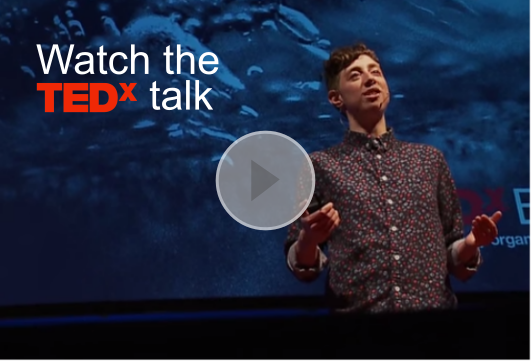 I found about you browsing videos at TED.com, as you were giving the talk I was laughing at all the descriptions you were making, laughed even harder when you said about the discovery of being a multipotentialite in the past 12 minutes. Have to say for me your talk was an eyeopener, because for many years I had this horrible feeling of not being able to “decide” what I want to do in life, so far I’ve been vet assistant most time of my childhood and adolescence, illustrator, comic creator and artist, storyboard artist, mayores in Comunication in college, dropped out from design, worked as a volunteer at a rehab institute, worked as counselor with kids in juvenile prision, studied japanese (twice) became a sort of anime expert, a gamer, I read all astrophysics articles I can because I wanna know more about the universe, currently studying Psychology, almost finishing the career at a new college and ready to go fort my masters degree, I’m a certified art therapist; painting artist, video editor, director, writer, social media manager for my dad’s company and I bet I’m leaving many more things out, but unfortunately I live in a country where being able to do ALL OF THIS it’s more a disadvantage because for most employers I have no “job skills”, sometimes I think I should escape Mexico and go somewhere else where people can appreciate my multiple skills, but at the same time I love my country and realized that if I wanna live here I have to use my superadaptability power to find a way to do all the things I love in a way that allows me to live. Anyway it’s refreshing to have found this site and as you said in your TED talk, knowing there’s nothing wrong with me, despite of being almost 40 (by the end of July) and a bunch of family and friend who say I don’t DO anything. So after this long post I just wanna thank you for helping me see that I don’t HAVE to quit in doing other things just to become ONE.